In the 60th year of his age. The verse etched in the top of John and Mary Stuart's box tomb is from a hymn written by John Leland in 1792. 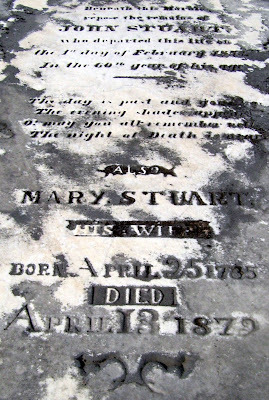 It is akin to one of the most common of epitaphs: Stranger, stop and cast an eye, / As you are now, so once was I. / As I am now, so you will be, / Prepare for death and follow me. The second verse of John Leland's hymn continues: We lay our garments by, / Upon our beds to rest; / Soon death shall soon disrobe us all, / Of what is here possessed. About a hundred years after the death of Mr. Stuart, this hymn was a favorite for gospel singers.